Fruits, veggies, flowers, and herbs galore! We accept cash, credit/debit, check, and SNAP/EBT. Portlandia FarmStandia is your one stop shop for produce grown in the Learning Garden using organic principles and practices. 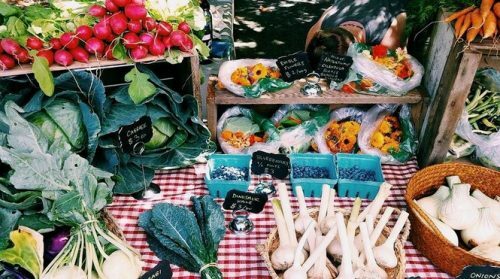 The farm stand offers an opportunity to taste the vegetables and fruits of our labors, and learn more about food preparation and preservation. You can help support and celebrate the efforts of our garden volunteers by making a purchase at the farm stand. Portlandia FarmStandia runs every Tuesday, mid-April October from 11:30am-3pm. We also open the farm stand on occasion throughout the off season (November March). Where is the Farm Stand located? Portlandia FarmStandia is located outside of Building 5 on sunny days and indoors in Building 5 (first floor near the cafe) during bad weather. Portlandia FarmStandia accepts cash, check, credit, debit, and EBT/SNAP. Do volunteers get a discount? Even better! Volunteers earn $5 to redeem at the farm stand for every hour they help in the garden. Volunteers redeemed $3,471 of Volunteer for Veggies vouchers in 2016. Where does the leftover food go? At the end of market acceptable produce donations will be made available to the Panther Pantry. Our farm stand prices are purposely kept below market averages for organic produce because we want to try and make good food available to everyone. We are not hosting a traditional farmers market with other farmers/vendors. Therefore we don’t need to worry about undercutting our neighbors who are trying to make a living from farming. Although the Learning Garden is not certified organic, all of the produce is grown without the use of pesticides and herbicides and using only sustainable gardening practices. Are the Learning Garden’s raised beds made with treated lumber? We have removed 20 of the 32 original raised beds in favor of a more efficient and ergonomic garden design. We currently maintain 12 of the original raised beds because of their utility for various course collaborations. Yes, the raised beds are made with arsenic-free pressure treated lumber certified by the American Wood Protection Association (AWPA). The wood preservative is listed as 0.15 pcf CA-C Ground Contact. CA-C stands for Copper Azole, Type C. The CCA preservative has been replaced by a new generation of safer preservatives. One of the first, and now most common is Alkaline Copper Quaternary (ACQ). In 2002, Chemical Specialties, Inc (CSI, now Viance) received the U.S. Environmental Protection Agency’s Presidential Green Chemistry Challenge Award for commercial introduction of ACQ. It’s introduction and use has contributed to significant reductions in arsenic and chromium associated with CCA. As mentioned the preservative in the wood we have is Copper Azole, Type C (CA-C). Like ACQ, it is a copper based preservative but instead of the quat biocide it has an azole co-biocide. This change has allowed a significant reduction in the volume of product needed to gain the same preservation qualities. Portlandia FarmStandia sales proceeds are returned directly to the Learning Garden budget to support ongoing operations, maintenance and expansion. Try something new! We have preparation and recipe suggestions available. And if you have a scrumptious recipe you would like to share, we’d be happy to add it to our collection.